Saw this at Trevor Loudon’s New Zeal Blog. I am also happy to oblige. Copied, pasted and now sending it out to blogoshpere! Earlier today I sent out a blast email detailing the info below. Ann Barnhardt, our Annie Oakley-Joan of Arc has posted it at her site too. I’d send you there, but Ann doesn’t use permalinks on her website. Instead, she encourages her readers to copy, paste and spin it out into the blogosphere. Happy to oblige. Remember the video of the captured Zeta narco terrorist I posted a couple of weeks ago in which he claimed to get weaponry directly from the U.S. government? Yep. He wasn’t kidding. Sold to the Zetas by the Obama State Department with the cooperation of the CIA, and once sold to Hizbullah, coming to a suburban Christian church near you. I’m telling you, our government has already been overthrown. The whole mess is beyond repair. You can’t fire two or three guys and think that is going to make any difference whatsoever. Hillary Clinton should only ever see her grandchildren five minutes at a time through a bulletproof plexiglass partition in Florence, CO. This was emailed to me by a reader. This guy is one of the founders of the major Mexican narco-terror gangs, Los Zetas. Los Zetas was founded by seven AWOL Mexican army special forces in 1999, of which this guy was one of the seven. He was just captured, and this recording is just a few days old. He implicates both the U.S. Government and the Mexican Government as being directly involved in arming Los Zetas. Interrogator: And where do you get your weapons? Rejón Aguilar: From the United States. All weapons come from the U.S.
Interrogator: How are they brought here? Rejón Aguilar: Crossing the river. We used to bring them through the bridge, but it’s become harder to do that. Interrogator: Who purchases the weapons? Rejón Aguilar: They are bought in the U.S. The buyers (on the U.S. side of the border) have said in the past that sometimes they would acquire them from the U.S. Government itself. Interrogator: And nowadays, who distribute them to you? Rejón Aguilar: It’s more difficult for us to acquire weapons nowadays, but we find ways. But it’s easier for the Gulf Cartel to bring them across the border. Rejón Aguilar: We don’t know why, but they bring them (accross the bridge) in the trunk of their cars without being checked (by Mexican Customs). One can only think that they must have reached a deal with the (Mexican) government. Interrogator: How often are they smuggled? Rejón Aguilar: Today it’s more difficult so it’s more sporadic, like every month, every 20 days, or every month and a half. It’s done when ever there’s an opportunity. Rejón Aguilar: The drugs are handled by a group of accountants. They handle that in private. It’s compartmentalized. Only they know how and when it’s smuggled to the United States. I suppose, with the way that things are right now, they probably smuggle the drug shipments every two or three months. Interrogator: How are the drug shipments smuggled to the U.S.? Rejón Aguilar: They bring it to the U.S. through Laredo, but that’s done by a compartmentalized group handled by the accountants. They are responsible for all that. Interrogator: Let’s talk about San Luis Potosi, do you remember the attack on the U.S. ICE agents? Rejón Aguilar: Yes. They (Los Zetas) were travelling in a caravan of bullet-proof vehicles. They mistook them for other people and cut them off. Interrogator: What’s happening in Tamaulipas? Rejón Aguilar: In Tamaulipas, there’s a war because of the separation of the cartels. But we’re on hold because there is too much government (troops) presence. Interrogator: Tell me about the armored (monster) vehicles. How were they made? How many of these vehicles were under your command? Rejón Aguilar: Three… five at one time. Interrogator: And out of these five vehicles, what type were they? Rejón Aguilar: They were armored trucks typically known as monsters. Interrogator: Were you ever prepared for being captured? Rejón Aguilar: One always knows that sooner or later, we will be captured. Interrogator: Is there someone you would like to ask for forgiveness? Interrogator: Yes. Like for your actions, or for disappointing somebody, like your children or your family? Rejón Aguilar: Yes. To my mother, because since all of this happened, I haven’t seen her for 17 years. Interrogator: And knowing that you haven’t seen your mother and she’s still alive, how do you feel? 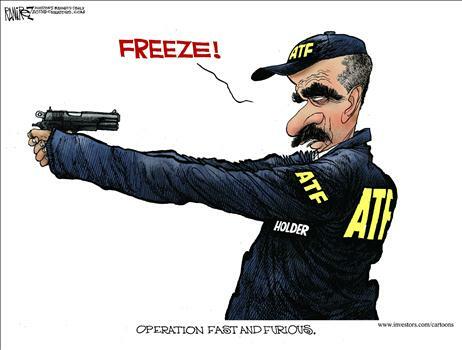 This entry was posted in Collectivist Narrative, Gun control and tagged Department of Justice, fast and furious, Gun sales to Zetas, Gunwalker, i, State Department. Bookmark the permalink. I follow Barnhardt and find her information credible and well supported. Her Christian bias (if it is a bias) is openly presented in a refreshingly full disclosure manner for all to witness. She is consistent in her worldview and no one need be surprised by it. *Sigh* Oh* Why, oh, why does every, and I mean – EVERY – non-left blog always, always, spread chain letters? That’s what this is. It doesn’t even appear as if Ann Barnhardt wrote it herself, and her site is full of trying to start chain letters. Honestly, we do not need more self-proclaimed Christians trying to make stuff go viral AKA spreading chain letters. She said she got it as an email from a reader, which means, the darn thing could’ve come from anywhere, really. Oh, it was so sweet when I read your post against spreading chain letters, and then BOOM – this happens. ARGH! Ann’s site is a mess anyway. Unkind words said from the extremist idiots who oppose her, and something she said back that made me blush to read. anyway, sorry, but this is incredibly disappointing, yet again. I’m afraid this will be just another big blog chain letter spreading over conservative blogs like wildfire, and giving the libs yet more ill-gotten lull at the expense of the non-left, and probably end up utterly debunked as a hoax on all hoax-busting sites. I just hope for the sake of all of us, that TruthOrFiction gets there before Snopes, because the far-right believes in the chain letter hoax that says Snopes is flaming leftist. If Snopes gets it first, no one on the republican side will believe whatever is eventually confirmed or denied as a hoax. Okay, I’m off to try getting out of this downer somehow. Miss Capri- First, I want to clarify for you that I found this information at a blog site that I have been reading for almost two years now. I have yet to find that this man did not do his “homework.” He is a reliable source to the best of my knowledge. Second, Ann Barnhardt wrote what I posted on her website (date and time of posting: July 11, 2011, 10:52 a.m. MST) You have to page down through her posts to get to it. I would not have posted it had I not verified that she indeed posted it. Third, the post at New Zeal did not include the referenced video so I sought it out to verify its existence as well as to include what Ms. Barnhardt had originally said about the video. The video is on Youtube if you’d like to check it out. Fourth, I am not familiar with Ann Barnhardt, but, as I said Mr. Loudon appears to treat her as a reliable source. If I find that there is something here that proves to my satisfaction to be incorrect, as I told you before I will correct/amend the post with that information. Finally, if your reference to “self-proclaimed Christians” refers to your disappointment with me I have to clarify for you that being a Christian does not mean that one is “perfect.” Making mistakes is the human condition. It is what one does with those mistakes that is the important point. Personal attacks to refute a claim are Alinsky tactics and really don’t help us get to the truth. Also, if you have further verifiable information that Ann Barnhardt is not a reliable source I would welcome that sort of input. Thank you for taking the time to read my posts and share your insight.